With the 'Noked' command system, commanders will have a clear picture of the battle, seeing exactly where each unit is located. A team of IDF programmers and engineers is developing a digital battle command system that will take the IDF's ground troops into the future, reported the IDF Blog. “Noked,” as the hi-tech, interactive mapping system is known, is an acronym for the Hebrew words “digital battle procedure.” With it, said the developers, commanders will have a clear picture of the front lines, seeing exactly where each unit is located in real time and interacting with other commanders to coordinate their moves. Noked fills a screen with a complete 3-D map of the battlefield, says the military website. Commanders can then use transparent layers to fill the map with information as it become available. “The picture comes alive. You can move layers around and zoom in on the map,” Major Moshe Castro, the officer in charge of the project, told the military website. Noked's most important feature is its ability to communicate battlefield changes and developments in real time. A unit that comes under fire, for instance, can pull up a 3-D map layer and quickly find a spot to relocate to, and its new position will be instantly communicated to all other active units. 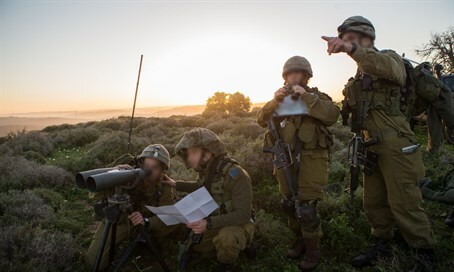 After the battle is over, the system allows for all troop movements to be replayed and reviewed, allowing the IDF to learn fine-tune strategies and methods. The first Noked prototype was revealed at a recent hackathon hosted at Ben-Gurion University in the Negev. Maj. Castro and six of his soldiers were on hand for the demonstration. “We tested the system and it worked,” he said. “I believe in this idea, and I believe it will spread around the military,” he said. The system was recently presented to the army as part of its multi-year training plan, and Castro will now have to pitch the platform to the military leadership.